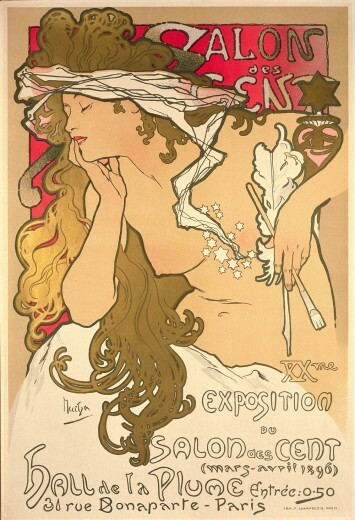 This poster announced the 20th exhibition of the Salon des Cent held at the premises of the art journal La Plume. The Salon des Cent included lithographic works for sale by artists associated with La Plume which included Toulouse-Lautrec, Bonnard, Ensor and Grasset. This poster, which secured Mucha's place in the group, introduced his archetypal style based on curved lines, light tones, flattened colours and strong outlines.